It was a wonderful weekend in Roseville, CA not only experiencing balmy weather of 58 degrees (back home it was below 0) but teaching my first Pelvis Restoration course in 2019 to these professionals. Close to half of the class was experiencing their first PRI course and this group asked awesome questions. Those attending the course for the second time also really appreciated the course updates with the Hruska Abduction Lift Test and respiration concepts related to the pelvic diaphragm. I truly feel that a deep understanding and appreciation for the three Primary Courses in PRI is key for clinic outcomes. Thank you Suzi and the staff at Sutter Physical Therapy for your hospitality and to Caleb Chiu for your amazing lab assistance. There is probably no one that has over 35 years of “breathing experience” as it relates to lower back dysfunction or chronic disease than Rosalba Courtney. I have referenced her, written about her, studied her work, and continue to read her material. She has always been a person I am mindful of when contemplating the role the ANS has on regulation and vagal tone. She was mindful of autonomic dysregulation long before the term “dysautonomia” or “persistent postural perceptual dizziness (PPPD)” became widely noted or understood. She always related neurophysiological disruption to the scientific evidenced-based perspectives of non-pharmacologic healing methods. This is what drew me to Rosalba. Her deep, deep respect for resonance and rhythmic respiration. It is such an honor to have her accept our invitation to come to Lincoln, Nebraska as our 2019 Interdisciplinary Integration Symposium keynote speaker. If there is one word that I correlate patterns and positions to, it is ‘oscillation’ largely because of individuals like Rosalba. Oscillatory activity occurs to help coordinate a system of “oscillating body systems.” After our personal conversation with her, I am sure this noted Australian will enlighten our sense of vibratory need. To read more of Rosalba's work, I would invite you to visit her website. What's even more exciting is that Rosalba is no stranger to PRI, as she has attended all of the courses we have hosted in Australia in the past few years. I am very much looking forward to finally meeting her, welcoming her to Lincoln, and introducing her to more of the PRI family. Our bodies live in ever changing conditions. For health and homeostasis to be maintained successfully we need to constantly adapt to constant change. Oscillations occurring within the functions of our various body systems help these systems to co-ordinate their functions so that they can work together to optimally react to change and maintain homeostasis. Breathing is an oscillating system that can influence the function and co-ordination of other oscillating body systems, particularly the autonomic nervous system, the cardiovascular system and the digestive system in ways that enhance or interfere with the function of those body systems. Every oscillating system has one or several resonance frequencies where unique capabilities emerge. Resonance frequencies of breathing can be used therapeutically to assist a range of health conditions including depression, anxiety, panic disorder, dysautonomia, asthma, fibromyalgia, chronic pain, functional gastro-intestinal and cardiovascular disorders. The healing and homeostatic effect of breathing oscillations can be optimized by improving the functionality of breathing. People with dysfunctional breathing have difficulties harnessing the healing powers of resonance frequency breathing. We well explore how 1. psychophysiological, 2. biomechanical and 3. biochemical dimensions of breathing functionality affect the breaths ability to heal and restore homeostasis and learn some techniques for assessing patients for with tools that can measure these various dimensions of dysfunctional breathing. We will then explore ways of modifying the practice of resonance frequency breathing to assist functionality in these 3 key breathing dimensions. The early registration deadline for the Interdisciplinary Integration Symposium is this Friday. CLICK HERE to register today! One of the more rewarding aspects of teaching PRI to movement professionals who are new to the science is their transition from initial shock, to their minds being blown a little (or a lot), to when it starts to click for them and start to see the PRI picture. This past weekend was one of those classes where the overwhelming majority of the attendees were new to the science of PRI. But it was also one of those classes where the overwhelming majority of the newcomers left understanding and appreciating how PRI, while challenging them in a good way, is an exceedingly necessary clinical tool for them. I have heard from several individuals in the days following the course as they express their gratitude to PRI for opening their mind and challenging their clinical perspective. Myokinematic Restoration is a great entry point to start one's PRI journey. We started our weekend by laying out the mechanical ramifications of the L AIC pattern, and how pathology may not be far behind. We then started our deep dive into neuromuscular behavior the Left AIC pattern puts us in, and how to get out of it. One of the main points of emphasis we have been attempting to drive home in this course is not only how to perform the positional and functional testing, but to understand what the tests mean. And, more importantly, what to do with that information in order to properly decide which PRI non-manual activities to choose. As a result, we constructed our lab time to reflect that concept. We were very fortunate to be able to spend at least half of Sunday in lab. The feedback we were getting was that participants could still feel their L IC Adductor and R Gluteus Max on Monday! That sensation is very helpful for them as movement specialists in order to feel those muscles and how that made them feel as a result. My thanks to Holli O'Kelley for her willingness to be our host. Her questions during the course were very helpful as well. My thanks to Barak Pearson, Kyle Sammons, and Young Filer for their interest and questions. My special thanks to Mary Faulk and Loren Johnson. Thank you for your openness and willingness to explore different treatment options. Thank you to Betsy Baker-Bold, PRC, for her assistance with our labs. 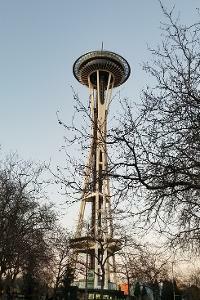 The Seattle area has been growing rapidly in PRI interest over the last several years, and Betsy is one of the main reasons for that growth. This weekend reminded me how grateful I am to PRI, and how humbling it is, as an instructor, to help fellow clinicians explore this new science. Minneapolis, Minnesota at Impact Physical Medicine and PRISM Aquatics Center. 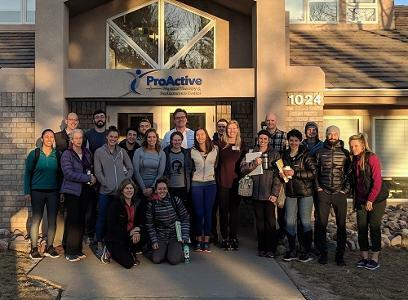 That’s where I spent this past weekend teaching Cervical Revolution to a group of 34 movement specialists who had a profound interest in PRI and the myriad compensatory strategies that humans develop to manage the neck and head. Stan Babel, the owner of Impact, is a powerhouse and a truly dedicated fan of PRI and goes way back to the early days of PRI. He worked with Ron long ago as this science was being first brought forward. He and Ron built the first PRISM pool in the world at Impact and it is still going today. Christie Amundsen PT, DPT, HFS, PRT and Mara Brandsoy OTR/L, PRC helped me get settled in and assisted me with our labs. Those two are just about the best and listening to them talk with course attendees and with Stan made me feel like one of the family. I always feel so welcome there. The Impact crew really knows their stuff. This Cervical Revolution class is such a game-changer for so many attendees and it can be for you as well. Did you know that cranial strain patterns as identified in the literature can and are frequently reduced through breathing techniques? Did you know that those same strain patterns are the result of cervical spine positioning? Did you further know that dental integration with PRI certified clinicians is an excellent mechanism for reduction of cervical patterned movement (or lack there of)? Did you know that dentists regularly attend PRI courses? This is because they realize that PRI provides them with the absolute best mechanism for aiding them in understanding the complexity of their neurological oral appliances. Our courses also arm them with understanding of a wide variety of other oral appliances as well! It is our hope that you will discover these exciting and new ways of learning the complexity of the human body as it relates to asymmetry. I hope I see you soon in a Cervical Revolution class. You’ll be glad you attended! It was a very cold weekend here in Lincoln Nebraska, and as a result of the weather and having a weekend off from course instruction, I had the opportunity to read, reflect and integrate. Therefore, it was a great weekend. This morning, I am reflecting again on material I read and perused, some of which was written by our speakers who are coming to Lincoln in April for the Spring Symposium. It is difficult to focus on what I need to do this week, because of my excitement for this collaborative event. Each of the speakers I have met and talked to in one form or another, and they all are people that have so much in common and so much to offer because of their dedicated work and dedicated pursuance of advanced work that is built off of integrative collaboration. I look forward to you meeting them and learn how they will help you advance your effort with airway oscillation, incorporation of glottal alignment and regulation of vibration in treating conditions associated with postural asymmetry. 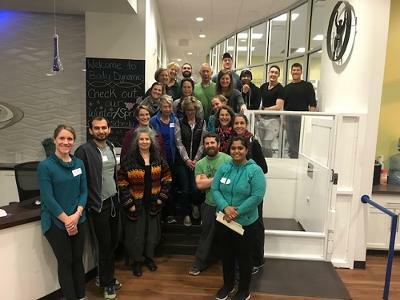 I had a great time with Brian Benjamin, DPT, PRC and the team at ProActive Physical Therapy teaching the new and improved Postural Respiration course. 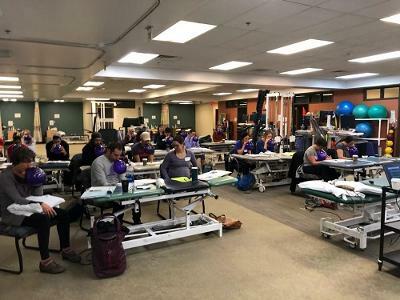 It was great having a number of experienced PRI clinicians present in the class to set the tone and help guide the new attendees, like Lisa Kelly, PT, PRC, and both Joshua Merrick, DPT and Rachel Kroncke, DPT, who have each attended 9 previous PRI courses. Those with experience were helpful for the 12 first time attendees in many ways, asking appropriate questions, providing guidance in the lab and overall just helping to make it a fun and rewarding experience for everyone. The new research articles and references included in this course really made the first part of Day 1 interesting and educational. It was powerful to take a close look at the important relationships between static asymmetry, dynamic respiration and patterned respiration. Experienced PRI clinicians as well as the first time attendees really benefited from the discussion with the material organized in this way. It was nice to redirect the focus back to the classic PRI concept of Left Posterior Mediastinal Expansion, something that has been a priority at this Institute for years, but can be overlooked if we're not careful. Other highlights of the course include the new explanatory sections for the AIC and BC tests, as well as the new Posterior Mediastinum Respiratory Reach Test. It was good to clear up the details of why we use a balloon for respiratory training with the new Standing and Seated PRI Balloon Techniques. It was also good to spend time with each of the newly organized Inhibition sections, for the Right Intercostal, Left Pectoral, Paravertebral, Anterior Neck, Right Latissimus and Left Posterior Mediastinum. And besides the Right BC Treatment Guidelines training, it was nice to have 2 full case studies in the appendix to help with practical application of the material. Overall a great weekend in a beautiful place focusing on PRI fundamentals, as I was honored to teach the flagship course of this Institute with a great group of professionals. It was meaningful for me to strengthen old relationships as I built new ones with some amazing people, who I am now grateful to call friends and associates. There probably is not a place on the body that I want to put my hands and eyes on more than the neck. It tells me so much about the neurologic state of the body, the position the body resides, the pattern of respiration placed on the thoracic diaphragm and the anterior neck muscle, the appendicular compensatory probability, the demands placed on dental occlusion, the manner of visual and auditory processing, the pharyngeal airway limitation and the voice habilitation existence. Our character and personality is refined and reflected by our cervical function, or lack of. Quite frankly, I can look at someone’s neck and become oriented to their orientation and probable individual needs for and from Postural Restoration integration and application. Our synergistic patterns of behavior are defined by the dimension and displacement of the vessels and their lumens and the string-like fiber of muscle, tendons, fascia, and nerves of the neck. 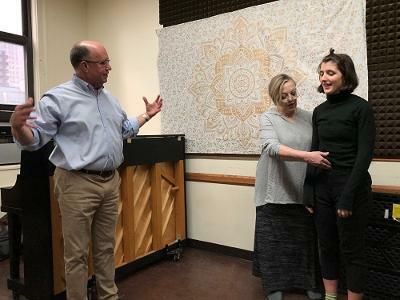 Last weekend's instruction and interaction with Skip George DC, PRC, who will be teaching this class with me on April 27-28 in Holland Michigan, allowed us to fully examine patterns of functional behavior that corresponds with limitations of cervical lateral flexion and axial rotation. I want to thank Alicia Ferriere DPT, PRC, Darlene Kalinowski PMA-CPT, Laura Paley PT, DPT, Yohei Takada DPT, CFMT, OCS, SCS, CSCS, Catherine Coelho PT, and Daniel Buron MS, CSCS for helping out with lab demonstration and class participation. I always enjoy having Michael Zhao BS, CSCS in my classes. His brain-centric view of the importance of including physiological, environmental and biologic political determinants in assessing synergistic patterns of behavior enlightens me. Thank you Michael for your ongoing participation and attendance after taking 17 PRI courses. 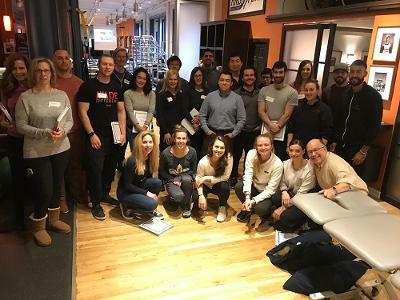 Lastly, thank you to Finish Line Physical Therapy for your ongoing support of PRI and continuing to host several courses a year in NYC, my home away from home.